In the United States, Sunday, May 14, is Mother’s Day. (Mothering Sunday was March 27 this year in the United Kingdom.) This is a good time to reflect on the status of women of all marital status and family situations in information technology. The results continue to disappoint. The job area with the highest projected growth rate over the next few years will be information security analysts, says Labor. A question is, will women continue to be underrepresented in this high-paying, fast-growing field? Or will the demand for analysts provide new opportunities for women to enter into the security profession? Impossible to say, really. Modern manufacturing requires a computer literate worker capable of dealing with highly specialized machines and tools that require advanced skills (STEM Education Coalition). However, other sources note that stereotyping and bias, often implicit and unconscious, has led to underutilization of the available workforce. The result is an overwhelming dominance of white men and scant participation of African Americans and other racial minorities, Hispanics, and women in STEM and high tech related occupations. The Athena Factor: Reversing the Brain Drain in Science, Engineering, and Technology, published data in 2008 showing that while the female talent pipeline in STEM was surprisingly robust, women were dropping out of the field large numbers. Other accounts emphasize the importance of stereotypes and implicit bias in limiting the perceived labor pool (see discussion below). 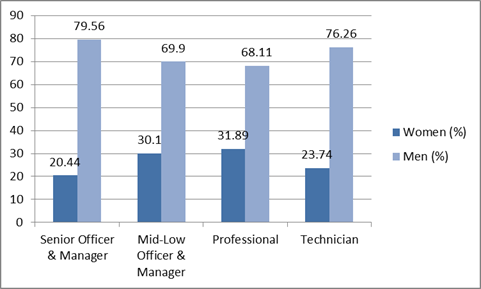 Moughari et al., 2012 noted that men comprise at least 70 percent of graduates in engineering, mathematics, and computer science, while women dominate in the lower paying fields. Others point out that in this is not uniformly the case in all science and math occupations and that, while underrepresented among those educated for the industry, women and minorities are more underrepresented among those actually employed in the industry. It has been shown, for example, that men are twice as likely as women to be hired for a job in mathematics when the only difference between candidates is gender. Women account for relatively small percentages of degree recipients in certain STEM fields: only 18.5 percent of bachelor’s degrees in engineering went to women in 2008. Over time, over half of highly qualified women working in science, engineering and technology companies quit their jobs. In 2013, just 26 percent of computing jobs in the U.S. were held by women, down from 35 percent in 1990, according to a study by the American Association of University Women. Although 80 percent of U.S. women working in STEM fields say they love their work, 32 percent also say they feel stalled and are likely to quit within a year. 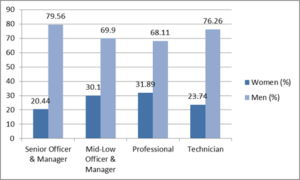 Research by The Center for Work-Life Policy shows that 41 percent of qualified scientists, engineers and technologists are women at the lower rungs of corporate ladders but more than half quit their jobs. 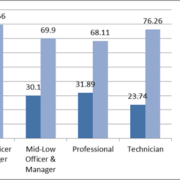 This loss appears attributable to the following: 1) inhospitable work cultures; 2) isolation; 3) conflict between women’s preferred work rhythms and the “firefighting” work style generally rewarded; 4) long hours and travel schedules conflict with women’s heavy household management workload; and 5) women’s lack of advancement in the professions and corporate ladders. If corporate initiatives to stem the brain drain reduced attrition by just 25 percent, there would be 220,000 additional highly qualified female STEM workers. Two-thirds of women report having to prove themselves over and over; their success discounted and their expertise questioned. Three-fourths of Black women reported this phenomenon. Thirty-four percent reported pressure to play a traditionally feminine role, including 41 percent of Asian women. Fifty-three percent reported backlash from speaking their minds directly or being outspoken or decisive. Almost two thirds of women with children say their commitment and competence were questioned and opportunities decreased after having children. The EEOC report adds that in tech, only 20.44% of executives, senior officials and managers are women – compared to 28.81% in all private industries in the U.S. Women certainly are succeeding in tech, and there are some high-profile women executives in the field —think Meg Whitman at HP, Marissa Mayer at Yahoo (now heading for the exit herself with a huge payout), Sheryl Sandberg at Facebook, Susan Wojcicki at YouTube, Virginia Rometty at IBM, Safra Catz at Oracle, and Ursula Burns at Xerox. That’s still a very short list. The opportunities for and presence of women in tech remain sadly underwhelming.